On Hanuman Jayanti day (November 4) during Diwali 2010, a 108-feet Hanuman Murti was unveiled at Jakhu Hill near Shimla in Himachal Pradesh. 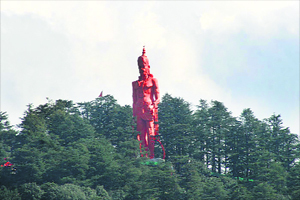 The Jakhoo Hill Hanuman Murti has height of 108 feet at the highest altitude of over 8100 feet and is constructed at a cost of Rs 10.5 million. Jakhu Hills is already renowned for a famous Hanuman Temple. Note - The tallest Hanuman Statue in the world is located at Paritala in Andhra Pradesh. It has a height of 135 feet. The 108-foot-high statue of Hanuman at the famous Jakhu temple is built by JHS Svendgaard Laboratories, India's largest oral care products manufacturers, and the HC Nanda Trust. The reinforced concrete Hanuman idol has been built at a cost of Rs. 1.5 crore, informed sources said. The Kesri idol will be illuminated at night with floodlights. Why Hanuman Murtis are painted red or sindhoor color?